The Sarbanes-Oxley Act, more commonly known as SOX is a United States federal law enacted in response to a number of major corporate and accounting scandals including those affecting Enron, Tyco International, Adelphia, Peregrine Systems and WorldCom. These scandals, which cost investors billions of dollars when the share prices of the affected companies collapsed, shook public confidence in the nation's securities markets. The Act contains 11 titles, or sections, ranging from additional Corporate Board responsibilities to criminal penalties, and requires the Securities and Exchange Commission (SEC) to implement rulings on requirements to comply with the new law. 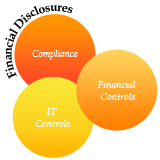 The Act also covers issues such as auditor independence, corporate governance, internal control assessment and enhanced financial disclosure. This SOX workshop is designed to help individuals understand the basic framework of the Sarbanes Oxley Act and how it impacts today’s organizations. It becomes mandatory for organizations to create awareness about SOX within the organization for successful and effective implementation of SOX and to develop consistency across the organization for SOX compliance. This workshop is designed to cater to the general audience and also meet specific learning needs of Finance, IT and Process Professionals. This workshop has been designed to enable participants help their organization comply with the full intent of the Sarbanes Oxley Act; gain more insight to applications controls design and help develop expertise in SOX compliance requirements. Participants will gain an understanding of why organizations need to build an efficient SOX compliance infrastructure and how technology can be a part of the solution to design, implement and maintain an effective compliance initiative. Anyone aspiring to understand SOX Compliance in a better manner would benefit from this workshop. This workshop is restricted to participants who have some exposure to process, controls and risk management.